How is it to feel on Cloud 9 – literally? 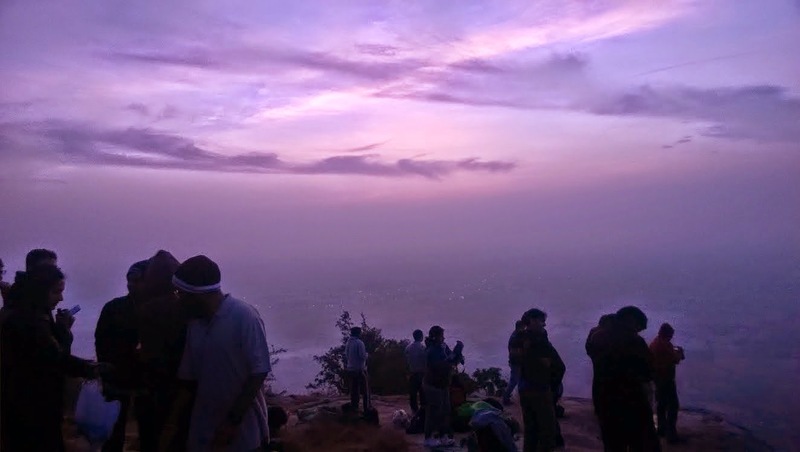 …and we felt that slice of heaven – in the midnight, at the peak of Skandagiri! Well..that was one of the highlighting experiences of the Skandagiri night-trek, something that is not captured in pics…hence I chose to start this post from that particular moment. We 22 shortlisted BTCians [including 2 organizers – Abhi and Hiren] boarded the Chikballapur bus at 6pm. After a hilarious attendance session (where every guy in the troupe was recognized as ‘that guy’ by Abhi – we never understood why :P), we started the ragging session. This time, for a change it was a ragging session for the organizers :P Abhishek was the first scapegoat. Starting from his recognition of ‘that guy’, to making everybody his ‘personal friends’, to appreciating his art of identifying all non-BTC people – the participants had an amazing time ragging Abhi that finally he got fed up and shouted out ‘Everybody rags me’ :D phir sabko daya aa gayi, and we decided to give him a break, and moved onto some chit-chat and munching session till we reached Chikballapur. Reached Chikballapur at around 8.00pm and started walking to find an ‘Isolated place’ (Abhi’s choice for introduction session). Post the introduction round at the isolated place, we started walking towards the trek base. The ascend was a full utilization of the dialog – ‘take 100 breaks’ :D. Considering the first-timers (first-time organizer Hiren too! :P) and the ‘moderate-level’ of the trek, Abhi kept the pace of the climb a little chillaxed. Also, since it looked like it had rained recently, we wanted to play it safe and cautious. His fettish for finding an ‘isolated-place’ now turned into a look out for every other ‘open-space’ for having a break! Everytime someone would call out ‘open space aa gaya’, it would follow by Abhi’s ‘chalo break lete hain’ :D – and that followed by narrations of previous trek experiences and some people stories…and then again climbing, till we finally reached the peak. Camp-fire and the insane fun! After dinner, few trekkers chose to take rest (smart Abhi also slept off to avoid further ragging:P), while the rest of us (despite sleepy) chose to stay awake and have fun over a camp-fire. We wanted to continue the game further, however since there was derth of sticks for the camp-fire, we stopped the game at two movies each side (that was hilarious enough) and then the scene’s background dimmed. The view, on the other hand, turned spectacular – with the clouds passing by us every now and then giving us an ‘out-of-the-world’ feeling. 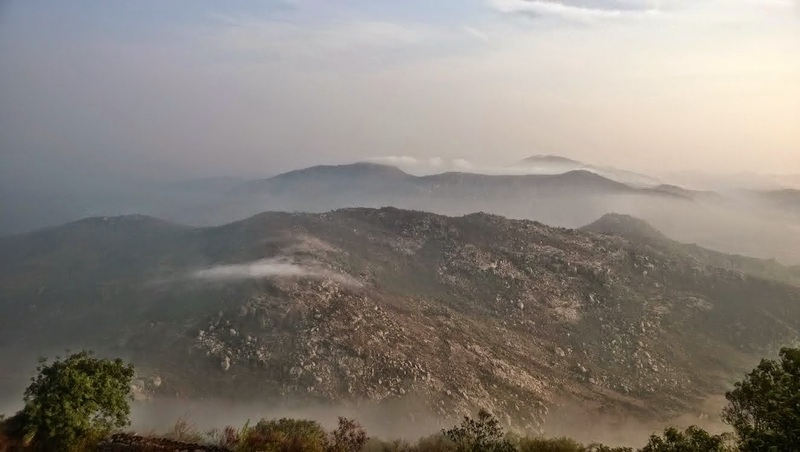 It was close to 4.00 am in the morning, when we decided to get up and explore the surrounding, and here’s is when we experienced the ‘heavenly’ feeling [described at the start of my post ;)] – an experience truly unspeakable! A Special moment captured in just hearts – The WOW Surpriiiiiiiseeeeeee!! It was close to 6.00 am. By now it was only Hiren, Monu, Shilpa, Sreemoyee and myself awake. We were just staring at the rising sun and clouds, when we heard the screeching sound of the dry bushes behind us. Monu and I turned back to look above, and we spotted 3 girls trekking down towards us. We were confused! I blurted out ‘Only girls?’ to Monu [BTC-WOW is the only girl trekker gang I know of], my mind dazed for a couple of seconds, when suddenly I happened to recognize a familiar face. It was KIRUBAAAAAAAAA [BTC WOW organizer] waving at us. And just when we started jumping and howling out of joy we could see Jyothi (WOW trekker) and then Captain Ajju announcing ‘Girls, do you like Surprises’ in her characteristic way. Having them with us so unexpectedly, swept us off our feet...and the rest was all howls, screams, shouts, emotions and hugs :D. Our howls were literally like an alarm clock that woke up the rest of the folks (and scared a few too! ), and there was a wave of energy in the group! [yo..so BTC organizers do love giving their folks a surprise :D]. This experience truly added the ‘WOW’ element to the entire trek – another moment that only our hearts could capture J - ah! watta day! Post all the morning hungama, we had a short photo session and then we headed towards the base. The path was little slippery due to mist, and we had to be cautious while descending too. Took our time, made fun and aaram se reached the base, thus completing the trek successfully. A big thanks to Captain Ajju and Sayeesha for having helped us with finding autos till the bus stop [the 4km walk while return was spared]. Stopped over at a restaurant for breakfast, caught a bus to Bangalore, and reached safe with a truly ‘Cloud 9’ feeling! Thanks to Abhi and Hiren – you were the coolest dudes throughout the trek bearing all our ragging cool-headedly; and yet managing things with diligence :D. And as usual, it was a team effort, so thanks to the entire group for having taken care of each other.